Choose the Yoga path that best suits you, and you choose the way to know God. The philosophy of Yoga tells us that the root cause of our sorrows and suffering is loss of contact with our true Self. Our recovery is only possible by reestablishing contact with our innermost Self, the Reality of all realities, and by recognizing that knowledge of Self is our salvation. 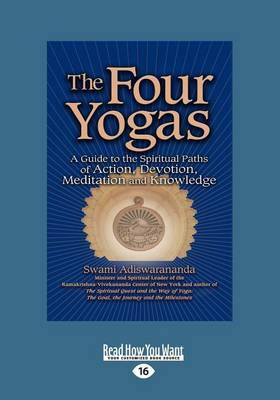 In this comprehensive guide, Swami Adiswarananda introduces the four spiritual paths of Yoga - Karma - Yoga, Bhakti - Yoga, Raja - Yoga and Jnana - Yoga - and what you can expect as an aspirant on each path. Covering the message and practice of each of the Yogas as well as philosophy and psychology, preparatory practices, common obstacles and ways to overcome them, this accessible book will prove invaluable to anyone wishing to follow a Yoga practice in order to realize the goal of Self - knowledge.